Caffeine naturally occurs in more than 60 plants including coffee, teas and cacao pods. Pharmaceutical manufacturers introduce caffeine into their products because of its physiological effects on the body, such as vasoconstriction in the brain that relieves headaches. Strattera, the brand name for atomoxitine HCl, is commonly prescribed to treat attention deficit hyperactivity disorder, or ADHD. Unlike other ADHD medications, Strattera is not a central nervous system stimulant but has dangerous side effects. Only take or administer Strattera under a doctor’s supervision. Various foods, beverages, dietary supplements and medications contain caffeine, including coffees, teas, chocolates, headache medications and weight-loss aids. 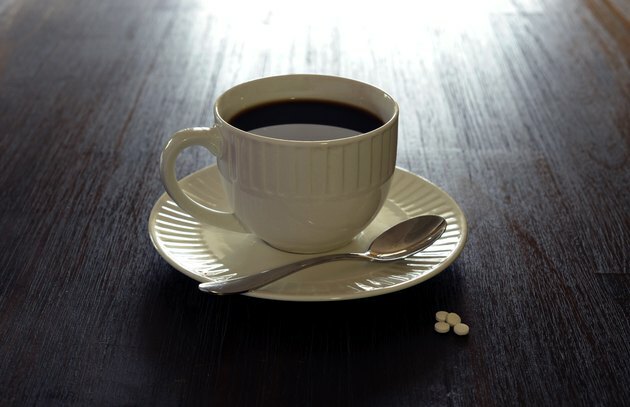 The U.S. Food and Drug Administration’s statistics show that approximately 80 percent of American adults consume 200 mg of caffeine daily, which is equivalent to one to two 5-oz. cups of coffee. Caffeine absorption occurs approximately 15 minutes after ingestion and causes temporary physiological changes, such as a pronounced feeling of alertness and increased heart rate. Caffeine stimulates the central nervous system, which includes the brain and spinal cord. It increases the rate of neuronal firing and stimulates the release of the hormones adrenalin, which triggers the “fight or flight” response, and dopamine, which elicits feelings of well-being. A study published in the August 2007 issue of “Neurology” found that women age 65 or older with no clinical dementia diagnosis who drank three cups of coffee daily showed a slower rate of cognitive decline. In June 2009, “Psychological Reports” published a study that tested the effects of caffeine on college students’ memory loss. Researchers gave the subjects a 200 mg dose of caffeine or a 250 mg dose of a lactose placebo. Thirty minutes after consumption, the subjects took a 6-word recall test and those who took caffeine recalled more words. Strattera is a prescription medication that works by preventing the re-uptake of selective norepinephrine in the brain. Physicians prescribe it to reduce ADHD symptoms in children age six and older, adolescents and adults. Strattera has been shown to adequately manage symptoms of ADHD, which include impulsive behaviors, hyperactivity and inattention. ADHD, a psychiatric disorder for which there is no physical test or exam, may be treated with various prescribed medications but Strattera works well for patients with co-existing conditions such as anxiety because it doesn’t worsen anxiety symptoms. Nervous system stimulant medications such as Adderall, the brand name for amphetamine and detroamphetamine, may aggravate anxiety or panic disorders. In September 2008 the FDA reprehended Eli Lilly and Company, the manufacturer of Strattera, for distributing misleading information about the drug. Strattera can cause mild to severe side effects including chest pain or discomfort, shortness of breath, nausea, a low fever, fainting, stomach pain or loss of appetite. Strattera.com warns that children and teens may develop suicidal thoughts while taking Strattera and should be closely monitored by the prescribing physician. The website further warns against using Strattera if you have taken a monoamine oxidase inhibitor, have narrow angle glaucoma, have or have had a tumor called pheochromocytoma or are allergic to Strattera’s ingredients. Both substances may cause increased heart rate and elevated blood pressure, which are precursors to strokes and heart attacks. Because caffeine stimulates the brain, it may impede Strattera’s actions to calm hyperactivity. Caffeine induces frequent urination while patients using Strattera have reported difficulty passing urine and an inability to fully empty the bladder. Caffeine may aggravate Strattera’s side effects.